Yes. You don't have to travel through different time zones. You can get jet lag right where you are. 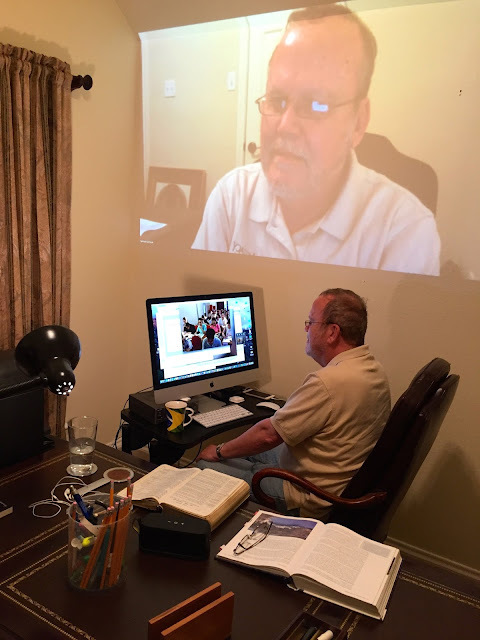 He got to teach a seminary class in Chengdu, China last week online live! We went there two years ago and, but this year Sam stayed home and got up early, and stayed up late, depending on the day. And here is that class taking my picture while I'm taking their picture! If you want to read a few blog posts of mine - about our actual China trip in 2014 you can click HERE and HERE and HERE ,oh and HERE. Or you can go check out Chengdu, China by clicking HERE. Who knew --- I'd be the grandmother of R2-D2 ?!? I hugged 2 police officers today.